A vehicle with Veyo drops off a client at a UConn Health satellite branch in West Hartford. Veyo has made some marked improvements in recent months, but the company hired to oversee the transportation of Medicaid patients continues to be criticized for its performance and has been fined several times by the state for contract violations. The San Diego-based company took over operations of the state’s non-emergency medical transportation program (NEMT) in January. In its first few weeks, Veyo was inundated with calls after patients waited on hold for hours when calling for rides, missed or were late for critical medical appointments, and were stranded at medical facilities when return rides didn’t arrive. The complaints and criticism have continued over the months, often coming into the public spotlight at meetings of the Medical Assistance Program Oversight Council (MAPOC). On Wednesday, David Coppock, Connecticut manager for Veyo, told a working group of MAPOC that the company has re-trained all call-center staff and reached out to health care facilities, including regularly contacting dialysis centers to assist with concerns. Coppock also presented data that showed that call center staff answered the phone, on average, in 42.6 seconds in August — down drastically from 474.4 seconds in January. He also said average wait times had dropped during the same months from 5.5 minutes to 2.8. Karen Buckley, vice president of advocacy at the Connecticut Hospital Association (CHA), commended Veyo for creating specific contacts for after-hours and weekend hospital discharges. “We asked for a person after-hours and on the weekend that we could call and the feedback from members today is that when they’ve used that they have been able to solve their problem relatively quickly and the response is positive,” Buckley said. But Buckley also said hospital officials still have concerns. She said CHA members are still experiencing inconsistent wait-times for pick-ups after discharges. The state Department of Social Services (DSS) has fined Veyo $13,500 from Feb. 1 to Sept. 7, according to state documents. 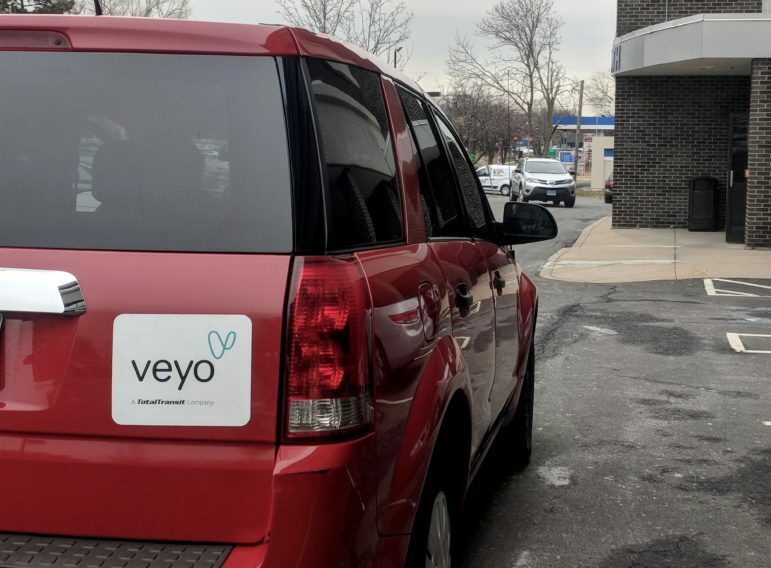 Veyo was fined for Medicaid patients waiting too long for pick-ups, transportation not showing up at all, and for violating “no multi-loading orders,” which exist for a variety of reasons, including when a patient is immunocompromised. Veyo was awarded a three-year contract, with the state paying the company $52 million in the first year, according to Veyo President Josh Komenda. 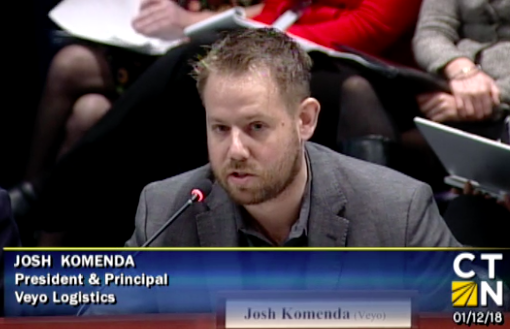 Komenda and a spokeswoman for the company declined to comment on the sanctions. Veyo was hired last year to arrange and oversee about five million rides annually. The company works with a myriad of private transportation companies, including taxis and ambulances, to provide the rides. It also hires private contractors and individual drivers to provide transportation. Some Medicaid advocates fiercely criticized Veyo at Wednesday’s meeting during public comment. Bonnie Roswig, a senior staff attorney for the Center for Children’s Advocacy, has attended many meetings to voice her deep concerns. All of Roswig’s clients are Medicaid recipients and she receives three or four calls each week about issues with Veyo, she said.